Solidea's Wonder Model Maman 70 Maternity Compression Tights - Super comfy maternity tights - £24.50 - made with sensuous compression, lets your body enjoy comfort, fit, style and well being. Graduated compression effectively improves blood circulation to prevent varicose and spider veins, and ankle swelling from water retention. allows easier dressing. 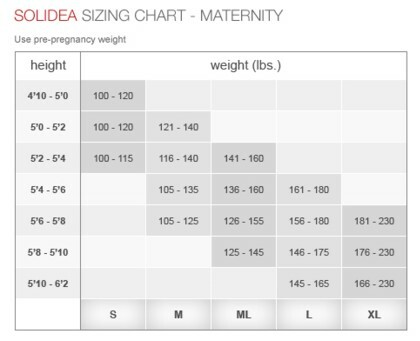 Solidea Wonder Model Maman 70 Maternity Compression Tights - Super comfy maternity tights made with sensuous compression, lets your body enjoy comfort, fit, style and well being. Graduated compression effectively improves blood circulation to prevent varicose and spider veins, and ankle swelling from water retention. Expandable soft tummy panel, abdominal supportive band, gentle comfortable waistband and exclusive massaging soles to relieve tired feet. Antimicrobial treatment for all day freshness. Great to use at any time during pregnancy, particularly later stages when bending is more difficult, as the medium compression in this tights allows easier dressing.